By Magic of the Mind | Comments Off on How many bodies do we have? 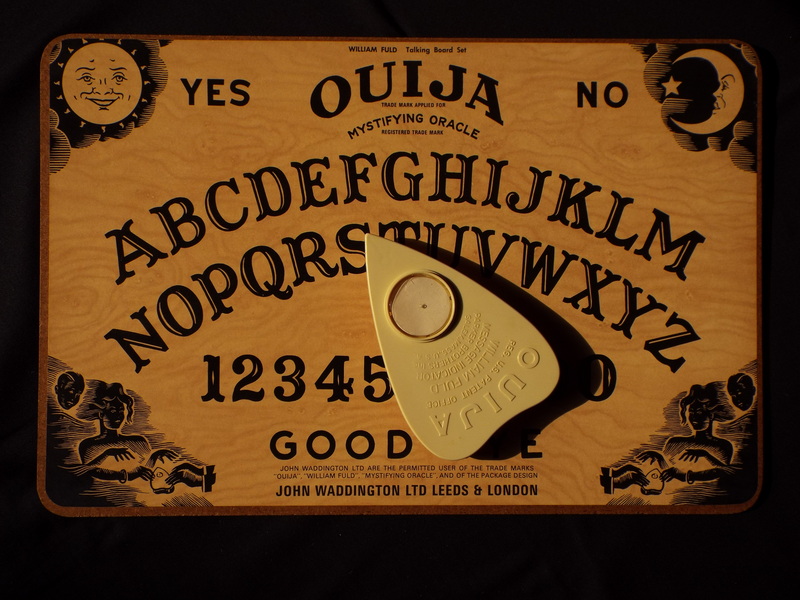 I’m sorry to disappoint you, but spirits don’t move the pointer on a Ouija board – well, not directly, anyway. We’ll get to that shortly. You’ll see that this one was marketed by the games manufacturers Waddingtons. It was sold in high street shops as a toy, in the late Sixties, and got them into a great deal of trouble, mainly from religious groups. It was quickly withdrawn from sale. I’ve blanked out the central window of the pointer (it originally had a nail in the hole in the middle) because the design is otherwise ambiguous; do you look through the window or at the tip of the pointer? The pointer is referred to in the instructions as a “mysterious message indicator”. Sometimes the term planchette is used, but strictly that refers to an earlier device of a similar shape, with a pencil at the tip and castors at the rear corners. Spiritualism began with the Fox sisters, whose spirits communicated by raps. This was a slow process, so later Spiritualists used automatic writing, either by directly holding a pencil or with a planchette. Unless a medium is particularly gifted, automatic writing is likely to produce illegible gibberish, so mediums moved on to using an upturned wine glass with paper letters on a smooth table and eventually marketed Ouija boards especially designed for the purpose. As I said at the beginning, spirits do not directly move the pointer, wine glass or planchette. All the above techniques are automatisms; they work through what is now known as ideomotor responses – automatic, involuntary muscular movements which are controlled by the unconscious mind (“UCM”). Dowsing instruments such as pendulums are also automatisms and work in a similar way. This is not, however, a full explanation. Automatisms certainly reveal information from the UCM, but this leaves open the question of how that information entered the UCM. There are several possibilities, which I’ll discuss with specific reference to the Ouija board. This is the conventional explanation – the UCM is communicating symbolically, either by making up a story from its contents, or by regurgitating or modifying one previously read or heard but forgotten – cryptomnesia. Jung’s idea of the Collective Unconscious could be brought in too. This type of explanation certainly accounts for many cases – but not all of them. A more promising explanation is that information enters the UCM through telepathy – direct mind-to-mind communication without the use of the known senses. This could be from other sitters at the table working the pointer, from onlookers – or it could be from spirits. The board could conceivably be communicating details of the past life of one of the sitters, or one of the onlookers through telepathy. I don’t want to go into past life theories in any depth here, but the main explanations for a genuine past life would have to be either reincarnation or genetic memory. This is the sceptic’s get-out-of-jail-free card. When faced with communications giving information which can’t be explained away by cryptomnesia or through other “normal” (i.e. non-paranormal) channels, a sceptic who rejects the idea that human consciousness can survive bodily death will resort to the “Super-ESP” hypothesis. He will argue that the information has entered the UCM through Extrasensory Perception – not just telepathy from someone in the room, but from a living person anywhere in the world, or from a book or other object (clairvoyance) – also anywhere in the world. He could also argue that this information could come from the future (precognition), the past (retrocognition) or from some universal memory bank. Many modern psychical researchers feel that this sort of explanation is more far-fetched than the simpler one of belief in spirit communication, and in any case there is no evidence that ESP is this powerful. Whether or not a Ouija board is communicating with spirits – evil or otherwise – or simply with the contents with our unconscious minds, great care should be taken when using one. Our UCMs contain some pretty unpleasant material. Sessions should always begin with a prayer to an appropriate deity or by setting up another form of psychic protection, and any entities summoned need to be properly dismissed at the end – treat them as “real” even if they may not be. Also take any information or advice received with a very large pinch of salt – you don’t know where it’s coming from. So, how does a Ouija board work? Well, the pointer is certainly moved by ideomotor responses from the sitters – but does it spell out messages from spirits? The answer is clearly “no” in some cases – but in others it may be “perhaps”. I don’t think we’ll ever be able to “prove” that spirit communication exists, because the sceptic can always fall back on the Super-ESP hypothesis (however unlikely) – but there’s strong evidence in some published cases of automatic writing. In the end it’s going to be subjective – is the evidence strong enough to satisfy you? Dr Moody based his book on about 150 case histories. Many more cases have been reported since the book was published, and there have been no doubt innumerable unreported cases since the dawn of history. In fact, the earliest report of an NDE can be found in The Republic, written by Plato in around 380 BC. Is this true? Is that what these (and other) case histories reveal? NDE phenomena are hallucinations caused by medicinal drugs and the malfunctions of a dying brain. Perhaps the most convincing – to non-sceptics – published case is that of Pam Reynolds, who featured prominently in a BBC documentary (you can currently find the segment on YouTube at http://www.youtube.com/watch?v=WNbdUEqDB-k ) and in the 1998 book Light and Death by Dr Michael Sabom. Pam was rendered “dead” for a difficult brain operation – her body was chilled and her brain completely shut down – before being successfully resuscitated. During the operation she experienced an NDE and was later able to give a detailed description of the surgical procedures. Sceptics have argued that the NDE took place before Pam’s brain was flatlined, and this may well have been the case for at least part of it. She did however describe one event which took place while her brain was inactive and in any case the rest of her experience is extremely difficult to explain away (especially as her eyes were taped shut and her ears blocked). Both Pam and her neurosurgeon were interviewed for the BBC documentary; Pam describes her experience and the surgeon comments that he is unable to explain her description of the surgical procedures. So far it’s the closest that we have come to an experimentally induced and controlled NDE and I recommend the YouTube clip if you haven’t seen it before. Have you ever been out of your body? Have you ever seemed to see the physical world from a location outside your body? If so, you’re among the 10% or so of people who have had an out of the body experience (“OBE”). Many of those have also apparently seen their own body from another point in space. This can be frightening when it happens for the first time, but generally speaking these experiences are not only harmless but also make you feel good afterwards; you don’t need to wonder whether part of you can live on when your body eventually dies – you know that it can. This is especially so in the special case of the Near Death Experience (which may be the subject of my next blog…). Terminology has changed over the years. The early writers, such as Sylvan Muldoon, Oliver Fox, “Ophiel” and “Yram” called the phenomenon astral projection, on the assumption that we all have an “astral body” as well as a physical one, and that this second body can be projected spontaneously or deliberately. Later, parapsychologists referred to travelling clairvoyance or ESP Projection. Currently the neutral term OBE (or occasionally OOBE) is preferred as it doesn’t imply any particular explanation. The first experience of an OBE is usually spontaneous – it’s accidental and unexpected. There are cases, for example, of road accident victims finding themselves floating above the scene looking down at their own injured bodies, and of patients who are able to describe everything which went on in the operating theatre while they were under general anaesthetic. Oliver Fox began with lucid dreams and false awakenings (discussed in my earlier blogs); Sylvan Muldoon and Robert Monroe, a more recent writer, began their experiences while lying awake in bed. The experience may take place (apparently) in the physical world, a close copy of it with differences from “reality”, or in another completely different “plane” or “dimension”. One thing which is immediately clear from reading accounts of OBEs is that there is a wide variety of experience. Writers such as Fox, Muldoon and Monroe learnt to induce OBEs deliberately; they all give detailed descriptions of their own experiences, and detailed instructions based on them – but their experiences, and therefore their techniques, are all different. Well, it’s unlikely that a second body is physically projected, firstly because it wouldn’t have sense organs such as eyes and secondly because it usually seems to “travel” in a pseudo-physical world, a reconstruction, rather than the real one. It’s more likely to be a product of the “mind” (whatever that is), possibly involving an element of ESP. How do you deliberately induce an OBE? Dream development, starting with a lucid dream. For more details you should of course refer to the original sources; I particularly recommend the classic The Projection of the Astral Body, by Sylvan Muldoon and Hereward Carrington, and Journeys Out of the Body by Robert Monroe. …have started either from lucid dreams or from the hypnopompic state, the half-awake state when you’re just waking up from sleep. For me this usually starts with the feeling that I can see the room even though I know my eyes are closed, and I can occasionally move my non-physical arms and apparently roll out of bed, leaving my body behind. Once I “walked” around what seemed to be my bedroom – finding objects that I knew shouldn’t be there – then onto the landing and downstairs. On other occasions I have passed through the closed window into the garden. These examples can be regarded as lucid dreams, but they qualify as OBEs if, as Dr Blackmore does, you define an OBE as the experience of being outside your body.